When four trending topics have something to do with one single event, you know how big that event is. I’m talking about the recently held NBA-PBA All Stars game held on IBC-13 sponsored by Smart Communications. How rare can you see a basketball game in the Philippines featuring the biggest stars of the NBA? We’re talking about Kobe Bryant, Chris Paul, Kevin Durant and Derrick Rose. The answer is once in a lifetime. It’s not surprising, therefore, that all things related to the game trended on Twitter. 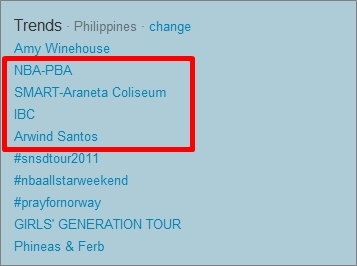 At one point the topics “NBA-PBA”, “SMART Araneta Coliseum”, “IBC” and “Arwind Santos” were trending simultaneously on twitter. The NBA stars won the game, 131-105. Arwind Santos was the top scorer for the PBA selection.